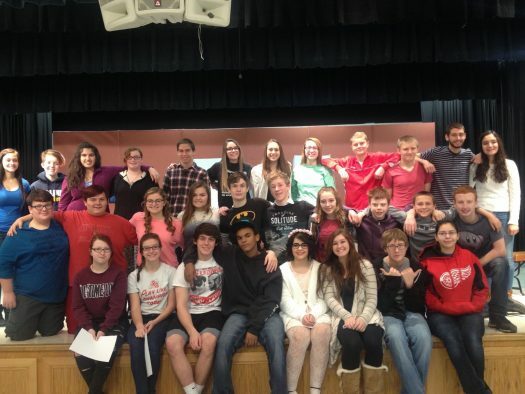 2016’s theater group has yet to perform another incredible play this winter. Instructor, Ms. Theresa Kuhrt, revealed to me that she is very confident in having a successful play in December. Theater student, Sydney Davis-Green, agrees with Ms. Kuhrt that this semester’s group of students are full of talent and are willing to get into character along with the veterans. “It is often a smaller role that steals the show! Ms. Kuhrt said. Being a part of theater at Hanover Horton High School since 1998, Ms. Kuhrt knows well enough that the parts with the most lines isn’t always the heart of the show. Ms. Kuhrt also states that even small parts like the dirt merchant (played by sophomore, Ryan Pluff) will get laughs. Mitchell Schuette, junior reveals all of his roles of being the prince, a dwarf, and the talking fish. “This semester’s group is full of talent and in the end we will once again perform a great and funny play,” Schuette said. The Brothers Grimm fairy tales are turned in a wild comedy, while the cast attempts to combine all 209 stories into one big laugh. Ms. Kuhrt even told that the audience even gets involved! After being in Theater for three years now, Davis-Green plays Rapunzel. “Rapunzel is a very sassy character who is questioning why she is trapped in a tower,” Davis-Green said. While still constantly rehearsing parts and making minor changes to the production, the theater class plans on bringing home yet again an amazing act!